How long will my newly polished marble floors last? Marble, limestone, crema marfil, travertine, slate, quarry tiles, etc. 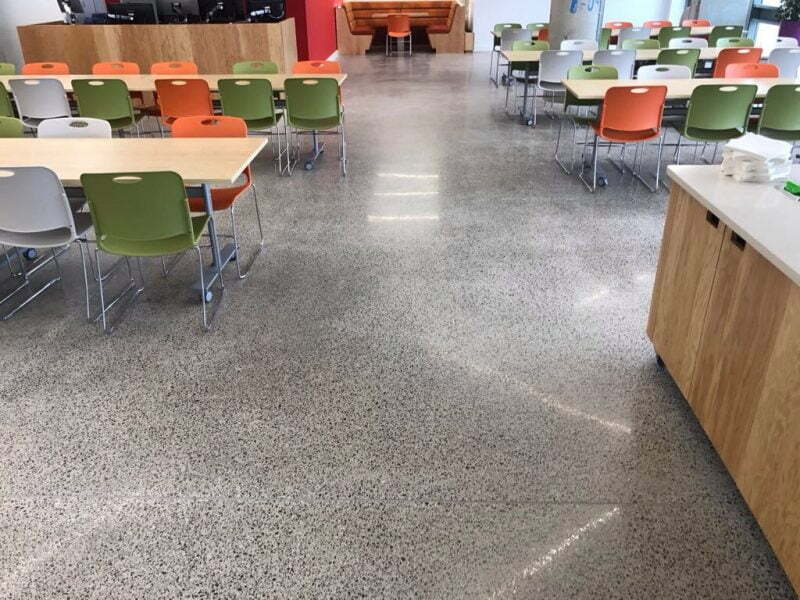 will need to be stripped, polished and sealed at regular intervals, or they will lose the deep lustre that makes them such a beautiful flooring solution. 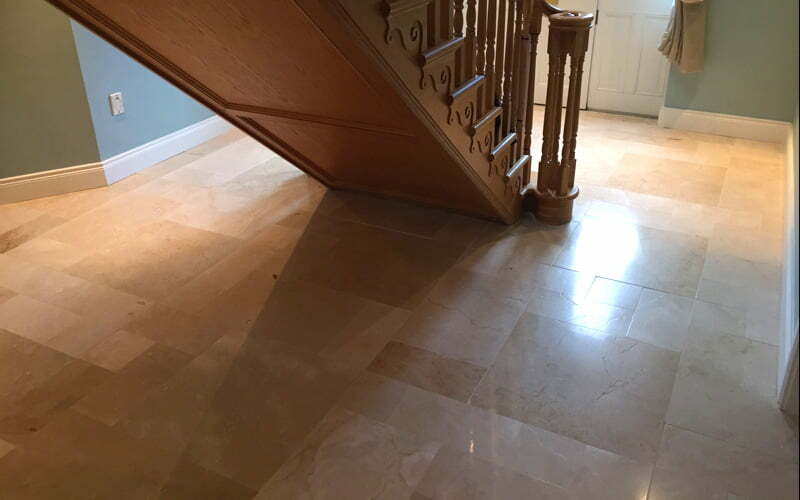 Our clients are always ecstatic when we carry out cleaning, polishing and sealing restoration works on their marble or natural stone floors. 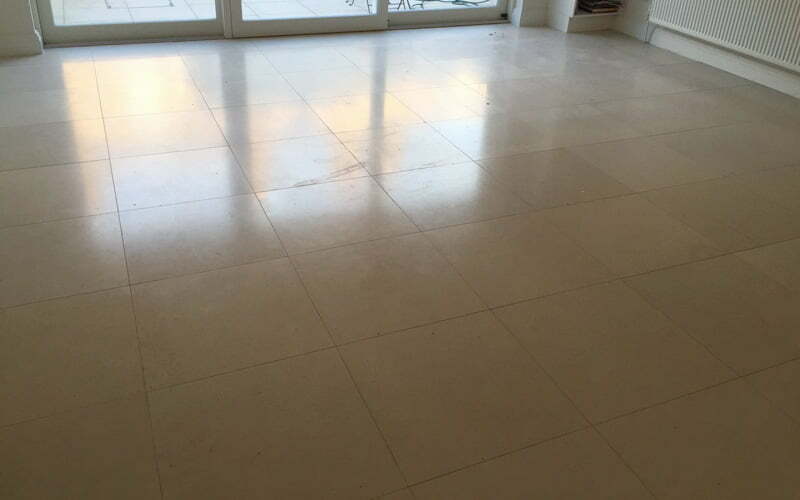 The majority have been extremely frustrated for some time with their floor – no amount of cleaning will take out the stains, the floor has completely lost its shine, has dull patches and the grout is very dirty. 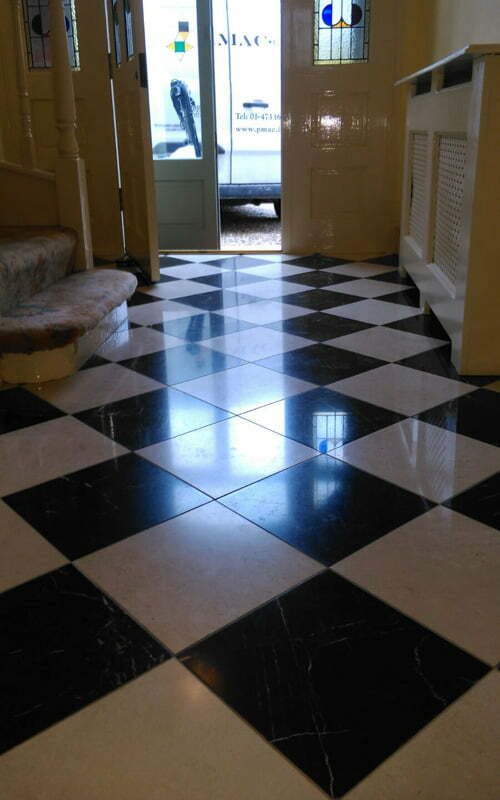 So, when we restore their marble or limestone floor to new they are extremely pleased and are left with that newly laid floor look. More often than not, they say the floor looks even better than when it was newly laid! Generally, however, the first question they ask is: how long will the shine last? Our stock answer is that your floor should stay looking good for one to three years. Some floors may last up to five years without requiring attention, but this would be in low traffic areas. 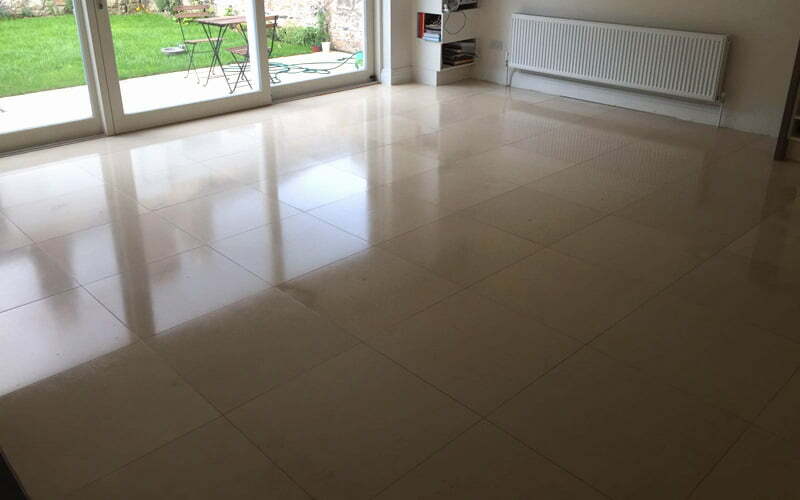 Our operatives will always leave you with advice on how best to maintain your stone floor, but general management is generally the same whichever natural stone you’ve opted for. Marble is a very porous material and it is through these pores that dirt gets in underneath the tile surface. This is why it is necessary to close up these pores by sealing the marble, preventing the dirt from getting in. Generally, when a marble floor loses its natural lustre it is a sign that the seal has worn off. This is when it needs to be re-sealed. If you have a large area to maintain we would advise you invest in a domestic floor buffer. This will greatly help retain the lustre and shine of your floor and lengthen the time between re-sealing. Buffing will not only restore lustre and shine to your floor, it will also help remove small scratches and nicks. Stone and grit brought in on shoes is the primary cause of scratches on your floor. It is therefore paramount to eliminate this as much as possible. The first thing you should invest in is good doorstep mats, both inside and outside all entrance doors. Another reason that floors lose their lustre quicker than they should is due to a build up of residue left from your cleaners. 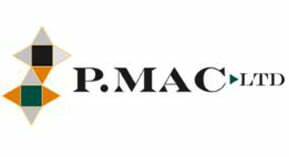 We recommend you use P Mac stone soap (a pH neutral soap) to wash your marble floors. This should also be used in your buffer – all that is required is a cap-full in a bucket of water. It is also a good idea to wash you stone floors with boiling hot water every so often to eliminate any build-up of soap residue. DO NOT, however, do this if your floors have been sealed with a topical seal, as the boiling water will break down the seal. Needless to say, never use anything except a recommended soap for marble and natural stone surfaces on your floors. If mopping by hand, ensure you use a clean mop and follow the instructions on the bottle. It can also be a good idea to spray your soap directly onto the floor and then remove with a clean wet cloth. Ensure all product is completely removed before you dry buff your floor with either your floor buffer or a clean white cloth. 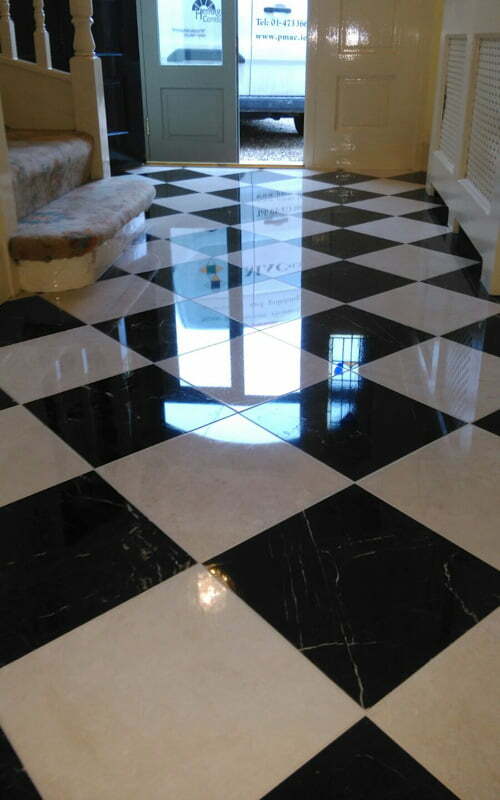 It is essential to dry buff your floor as this will bring up the shine in your marble floor. It is also imperative you change the water frequently when washing your marble or stone floors. Dirty water is notorious for lodging into your grout and causing it to deteriorate quicker than it should. 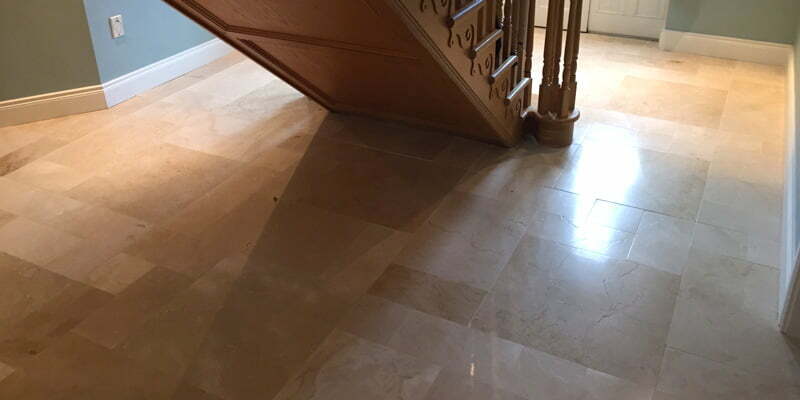 We generally seal all marble, limestone, travertine and crema marfil floors with a penetrating seal. This is a water-based sealer which will not alter the appearance of your tiles. It penetrates into the stone and is useful for preventing spills seeping deep into your stone. You still however have to mop up the spill straightaway, the penetrating seal just gives you more time. 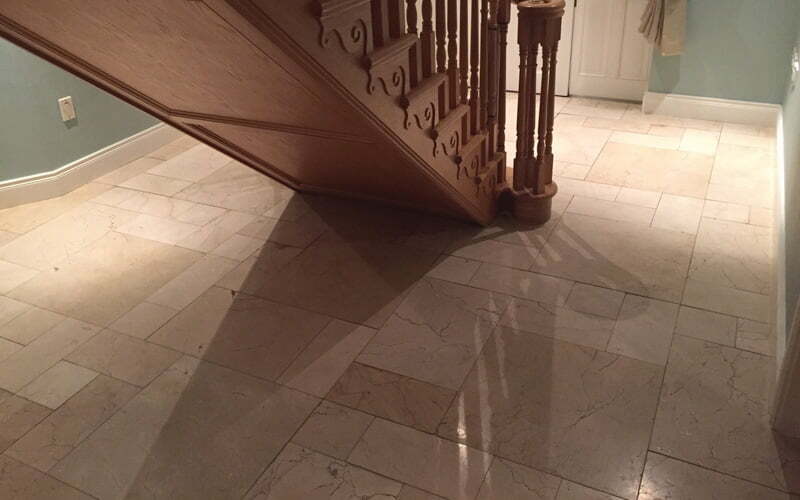 More porous stone is generally sealed with a topical coating, which leaves a film on top of the floor. A topical seal sits on top of the tile and basically when caring for your floor you are really caring for the coating. The maintenance programme is the same as for a floor sealed with a penetrating seal, except for the boiling water trick of course! Generally, a floor sealed with a topical seal needs to be treated more often. https://www.pmac.ie/wp-content/uploads/2016/11/How-long-will-my-newly-polished-floors-last-P-Mac.jpg 400 800 P Mac https://pmac.ie/wp-content/uploads/2016/07/P-Mac-Dublin-masonry-and-stoneworks-contractor.jpg P Mac2016-11-24 13:16:572016-11-24 13:16:57How long will my newly polished marble floors last?